Hyderabad serial blasts have been another slap on the security system of our nation. It has been said that the government was getting continuous threats after the execution of death sentence of Afzal Guru from terrorist groups for doing such terror attack. The government is being blamed by common people and opposition parties for not taking the threats seriously. The total number of deceased victims have reached to 14 in the bomb blasts in hyderabad, out of which 5 were students. The blasts, triggered by improvised explosive devices (IED) tied to two bicycles, took place at two sites 100 metres apart. This is not the first time that such a terror attack took place. Few days back, Indian soldiers were the victim of such attack before that Attack in Pune and before that the Delhi Parliament Attack (Afzal Guru Case) and still before that the 26/11 Mumbai Attack Case (Ajmal Kasab Case). Here is another such real story of terrorist, that reached the supreme court. Before :- P. Sathasivam and Asok Kuamr Ganguly, JJ. For the Appellants :- Irshad Ahmad, Mr. Arvind Kumar Shukla, S. Pasobola, Prem Malhotra, Ms. Mrinmayee Sahu and Rishi Malhotra, Advocates. For the Respondents :- Gopal Subramaniam, SG, H.P. Rawal, ASG, Ms. Ranjana Narayan, Satyakam, Arvind Kumar Sharma, P. Parmeswaran, Arun R. Pednekar, Sanjay Kharde, Ms. Asha G. Nair, Ravindra Keshvaro Adsure, V.N. Ragupathy, Advocates. A. Extradition Act, 1962, Sections 21 and 2(f) - Accused committing offences of serious nature (Bomb lasts, murder etc) and fled to Portugal - On request of Government of India, Portugal Government granted extradition with stipulation that accused will be tried only in respect of offences specified in extradition order and he will not be subjected to death penalty or imprisonment beyond 25 years - Government of India gave solemn sovereign assurance to this effect - Accused can, however, he tried for lesser offences - This is permitted under Section 21 of Extradition Act - Government of India issued a notification under which provisions of the Extradition Act, 1962 have been made applicable to Portugal - There has been no violation of Rule of Speciality and the Solemn Sovereign Assurance given by the Government of India. 1. The term 'extradition' denotes the process whereby under a concluded treaty one State surrenders to any other State at its request, a person accused or convicted of a criminal offence committed against the laws of the requesting State. 2. Extradition is founded on the broad principle that it is in the interest of civilised communities that criminals should not go unpunished and on that account it is recognised as a part of the comity of nations that one State should ordinarily afford to another State assistance towards bringing offenders to justice. (a) reciprocity, (b) double criminality, (c) extraditable offences, (d) specialty and (e) non inquiry. 1. There is no Extradition Treaty between India and Portugal - However, the laws of both the countries permit entertaining request for extradition from Non Treaty States also. 2. The primary consideration for the request of extradition was the assurance of reciprocity. 3. Provisions of Extradition Act shall apply to Portuguese Republic in accordance with the principal of reciprocity. E. Extradition Act, Section 2(f) - Extradition, deportation and exclusion - Distinction - The term 'extradition' denotes the process whereby under a concluded treaty one State surrenders to any other State at its request, a person accused or convicted of a criminal offence committed against the laws of the requesting State - Extradition is founded on the broad principle that it is in the interest of civilised communities that criminals should not go unpunished and on that account it is recognised as a part of the comity of nations that one State should ordinarily afford to another State assistance towards bringing offenders to justice. Daya Singh Lahoria v. Union of India, 2001(2) R.C.R. (Criminal) 535 : (2001) 4 SCC 516. Suman Sood @ Kamaljeet Kaur v. State of Rajasthan, 2007(3) R.C.R. (Criminal) 119 : 2007(3) R.A.J. 99 : (2007) 5 SCC 634. Soering v. United Kingdom, 1989 (11) EHRR 439. Canada v. Schmidt, (1987) 1 SCR 500. P. Sathasivam and Ashok Kumar Ganguly, JJ. (Concurring) - The appeals and the writ petition raised a common question, as such were heard together and are being disposed of by this common judgment. The grievance of the appellant-Abu Salem Abdul Qayoom Ansari in the appeals and writ petition is that the criminal courts in the country have no jurisdiction to try in respect of offences which do not form part of the extradition judgment, by virtue of which he has been brought to this country and he can be tried only for the offences mentioned in the extradition decree. 2. Criminal Appeal No. 990 of 2006, filed under Section 19 of the Terrorist and Disruptive Activities (Prevention) Act, 1987 (hereinafter referred to as "the TADA Act"), arose out of framing of charge on 18.03.2006 against the appellant by the Designated Court at Arthur Road Jail, Mumbai in RC No. 1(S/93)/CBI/STF known as Bombay Bomb Blast Case No. 1 of 1993 and the order dated 13.06.2006 passed by the said Court separating the trial of the accused/appellant from the main trial in the Bombay Bomb Blast Case. 3. The appellant filed Criminal Appeal Nos. 1142-1143 of 2007 against the order dated 16.04.2007 by the same Designated Court, framing charges against him under Sections 120B, 302, 307, 387, 382 IPC and under Sections 3(2)(i), 3(2)(ii), 3(3), 3(5) and 5 of the TADA Act. 4. In addition to filing of the above said appeals, the appellant has also filed Writ Petition (Crl.) No. 171 of 2006 under Article 32 of the Constitution of India seeking a) to issue a writ of Certiorari to nter aliash the charges framed against him in Bombay Bomb Blast Case No. 1 of 1993 arising out of RC No. 1(S/93)/CBI/STF by framing of charge on 18.03.2006; b) to issue a writ of Certiorari to nter aliash the order passed by the Designated Court under TADA Act dated 13.06.2006 passed in Misc. Application No. 144 of 2006; c) issue a writ of Certiorari to declare that the charges framed on 18.03.2006, in Bombay Bomb Blast Case No. 1 of 1993, as violative of the Rule of Speciality and Section 21 of the Extradition Act, 1962; (d) issue a writ of Mandamusto release and discharge the writ petitioner by nter aliashing all the proceedings against him; (e) issue a writ of Prohibition prohibiting the respondents from prosecuting the writ petitioner any further for the offences for which the petitioner has not been extradited by the Court of Appeals at Lisbon as affirmed by the order of the Supreme Court of Portugal; f) issue a writ of Prohibition prohibiting the Designated Court at Arthur Road Jail at Mumbai from separating the trial of the writ petitioner from the other accused whose trial is stated to have been completed. a) On 12.03.1993, there were a series of bomb explosions in the Mumbai City which resulted in death of 257 persons, injuries of various types to 713 persons and destruction of properties worth more than Rs. 27 crores (approximately). These bomb explosions were caused at vital Government installations, public places and crowded places in the city and its suburbs with an intention to overawe the Government established by law, and to strike terror among the public at large and also to adversely affect the peace and harmony among different sections of the people. Twenty-seven criminal cases were registered at respective Police Stations with regard to the said bomb explosions and subsequent recovery of arms, ammunitions and explosives, which were illegally smuggled into the country with the intention to commit the said terrorist acts. On completion of investigation, it was disclosed that various acts committed by the accused persons were out of a single conspiracy and, therefore, a single charge-sheet was filed in the specially created Designated Court, Mumbai, against 189 accused persons including 44 absconders on 04.11.1993 for offences punishable under Section 120B read with Sections 324, 326, 427, 435, 121, 121-A, 122, 307, 302 and 201 of the Indian Penal Code read with Sections 3, 4 and 5 of the TADA Act read with Sections 3, 7(a), 25(1A), 25(1AA), 26, 29, 35 of the Arms Act, 1959 read with Sections 3, 4, 5 and 6 of the Explosive Substances Act, 1908. The appellant-Abu Salem was one of the absconders mentioned in the charge-sheet. b) The investigation disclosed that the appellant-Abu Salem and other accused persons hatched a criminal conspiracy during the period December, 1992 to April, 1993 with an object to create disturbances of serious nature by committing terrorist acts by bomb explosions, murders and causing destruction of properties throughout India. In pursuance of the said criminal conspiracy, a large nter aliantity of arms like AK-56 rifles, pistols, hand- grenades, ammunitions and RDX explosives were illegally smuggled into the country through sea at Dighi Jetty and Shekhadi ports in Maharashtra State during January and February, 1993. These illegal arms and ammunitions were kept and stored at different places with different persons with the object to commit terrorist acts. c) The appellant-Abu Salem was entrusted with the task of transportation of illegally smuggled arms and ammunitions, their storage and distribution to other co-accused persons. Investigation has disclosed that a portion of arms and explosives, which were smuggled and brought illegally into India on 09.01.1993, were taken to the State of Gujarat and stored at Village Sansrod, Dist. Bharuch. In the second week of January, 1993, on the instructions of absconding accused, Anees Ibrahim Kaskar, appellant-Abu Salem brought AK-56 rifles, their ammunitions and hand-grenades from Village Sansrod to Mumbai and distributed the same among co-accused persons. d) On 12.03.1993, RDX filled vehicles and suit-cases were planted at strategic places like Bombay Stock Exchange, Air India Building, Near Shiv Sena Bhawan, Plaza cinema and thickly populated commercial places like Zaveri Bazar, Sheikh Memon Street etc. The suit-case bombs were also planted in the rooms of 3 five-star Hotels, namely, Hotel Sea Rock, Bandra, Hotel Juhu Centaur and Airport Centaur, Mumbai. Explosions were caused from the said vehicle-bombs and suit-case bombs in the afternoon of 12.03.1993 and within a period of about two hours, large-scale deaths and destruction was caused, as described earlier. Hand-grenades were also thrown at two places i.e. Sahar International Airport, Mumbai and Fishermen Colony, Mahim, Mumbai. The explosions caused by hand-grenades also produced similar results. e) During the course of investigation, a large nter aliantity of arms, ammunitions and explosives were recovered from the possession of accused persons. In India, AK-56 rifles, ammunitions and hand- grenades cannot be possessed by private individuals, as these types of sophisticated arms and ammunitions can only be used by the armed forces and other law enforcing agencies. f) Since the appellant-Abu Salem absconded and could not be arrested during the course of investigation, he was shown as an absconder in the charge-sheet. The Designated Court, Mumbai, issued Proclamation No. 15777 of 1993 against him on 15.09.1993. As the accused did not appear before the Court despite issuance of Proclamation, he was declared as a Proclaimed Offender on 15.10.1993. The Designated Court, Mumbai issued Non-bailable Warrant against appellant-Abu Salem and Interpol Secretariat General, Lyons, France also issued a Red Corner Notice No. A-103/3-1995 for his arrest. g) During the course of trial, the Designated Court, Mumbai, framed common charge of criminal conspiracy punishable under Section 3(3) of the TADA Act and Section 120 B of the Indian Penal Code read with Sections 3(2)(i), (ii), 3(3), 3(4), 5 and 6 of the TADA Act read with Sections 302, 307, 326, 324, 427, 435, 436, 201 and 212 of the Indian Penal Code and offences under Sections 3 and 7 read with Sections 25 (1A), (1B), (a) of the Arms Act, 1959, Sections 9-B(1), (a), (b), (c) of the Explosives Act, 1884, Sections 3, 4(a), (b), 5 and 6 of the Explosive Substances Act, 1908 and Section 4 of the Prevention of Damage to Public Property Act, 1984 against all the accused who were present before the Court, as also the accused who are absconding including the appellant. The Designated Court, Mumbai, on 19.06.1995, ordered that the evidence of the witnesses may be recorded against absconding accused persons in their absence in accordance with the provisions of Section 299 Cr.P.C. h) On 18.09.2002, the appellant-Abu Salem was detained by the Portugese Police at Lisbon on the basis of the above mentioned Red Corner Notice. In December 2002, on receipt of the intimation about his detention in Lisbon, the Government of India submitted a request for his extradition in 9 criminal cases (3 cases of CBI, 2 cases of Mumbai Police and 4 cases of Delhi Police). The request was made relying on the International Convention for the Suppression of Terrorist Bombings and on an assurance of reciprocity as applicable in international law. Along with the requisition of extradition, the relevant facts of the cases were enclosed in the form of duly sworn affidavits of the concerned Police officers, together with other supporting documents. The letter of requisition was issued under the signature of the then Minister of State for External Affairs and the affidavit-in-support was affirmed by Sr. Superintendent of Police, CBI/STF. i) On 13.12.2002, the Government of India issued Gazette Notification No. G.S.R.822(E) in exercise of the powers conferred by Sub- section (1) of Section 3 of the Extradition Act, 1962, directing that the provisions of the Extradition Act, other than Chapter-III, shall apply to the Portuguese Republic with effect from 13.12.2002. (i) not be prosecuted for offences other than those for which his extradition has been sought. (ii) not be re-extradited to any third country. vi) Offence punishable under Section 3(2) of TADA (P) Act. Death Penalty in this case. m) On 01.03.2006, after completion of further investigation against the appellant-Abu Salem, a Supplementary Report under Section 173(8) of Cr.P.C. was filed in the Designated Court, Mumbai. Prior to that, on 09.12.2005, the Designated Court altered the common charge of criminal conspiracy by adding the name of the appellant-Abu Salem in the list of the accused persons before the Court by deleting his name from the list of absconding accused in the said charge. On 18.03.2006, after hearing the counsel for the appellant and the Prosecution, the Court framed substantive charges against the appellant-Abu Salem. i) Offence of criminal conspiracy punishable under Section 120-B IPC r/w. offences punishable under IPC, TADA (P) Act, Explosive Substances Act, Explosives Act, Arms Act and Prevention of Damage to Public Property Act. ii) Offence punishable under Section 3 (3) of TADA (P) Act, 1987.
iii) Offence punishable under Section 5 of TADA (P) Act, 1987.
iv) Offence punishable under Section 6 of TADA (P) Act, 1987.
v) Section 4(b) of the Explosive Substances Act, 1908.
vi) Section 5 of the Explosive Substances Act, 1908.
vii) Section 25 (1-A)(1-B)(a) r/w Sections 3 and 7 of the Arms Act, 1959.
viii) Offence punishable under Section 9-B of the Explosives Act, 1884.
o) These charges have been framed by the Designated Court keeping in view the provisions contained under Section 21 of the Extradition Act, 1962.
iii) Section 4-b of Explosive Substances Act, 1908 Imprisonment for 20 years. iv) Section 5 of the Explosive Substances Act, 1908 Imprisonment for 14 years. v) Section 25 (1-A)(1-B)(a) of Arms Act, 1959. Imprisonment for 10 years. vi) Section 9-B of Explosives Act, 1884 Imprisonment for 3 years. (q), The request for extradition of the appellant-Abu Salem has been made relying on the assurance of reciprocity as applicable in international law and the International Convention for Suppression of Terrorist Bombings. The order dated 27.01.2005 of the Supreme Court of Justice, Portugal mentions that Article 9.3 of the said Convention applies to the case of appellant-Abu Salem. As per Article 9.3, the State Parties, which do not make extradition conditional on the existence of a treaty, shall recognize the offences themselves subject to the conditions provided by the law of the requested State. Article 2 of the Convention defines the extraditable offences. The above mentioned offences for which the extradition has not been specifically granted, also covered under the definition of extraditable offence, as mentioned in Article 2 of the said Convention. (r) The punishment provided for the offences, not included in the order of Supreme Court of Justice of Portugal, is lesser than the punishment provided for the offences included in the said order of Extradition. The said offences are disclosed by the facts, which were considered/proved for the purposes of extradition of appellant- Abu Salem from Portugal. It was further stated that the said offences are extradition offences, as defined under Section 2(c)(ii) of the Extradition Act, 1962 and, thus, the trial of appellant-Abu Salem for these offences is permissible under Section 21(b) of the Extradition Act, 1962. (s) After framing of the charges on 18th March, 2006, the Designated Court invited the views of the prosecution and the defence about the further course of action for the trial of appellant-Abu Salem. The prosecution, Vide M.A. No. 144 of 2006, submitted its views to the Designated Court, suggesting therein that the trial of appellant-Abu Salem may be separated in the same manner as was done by the Designated Court in respect of absconding accused Mustafa Ahmed Dossa, upon his arrest in March 2003, to avoid hardships to 123 accused persons whose trial had already been completed. It was further submitted by the prosecution that 33 accused persons were in custody for the last about 12-13 years. The course of action as suggested by the prosecution would not cause any prejudice to any accused, including appellant-Abu Salem and would also avoid further delay in pronouncement of the judgment in the case. The Designated Court, Mumbai, after hearing both the sides, by its order dated 13.06.2006 ordered that the trial of appellant-Abu Salem, co-accused Riyaz Ahmed Siddique and other absconding accused, mentioned in the common charge of criminal conspiracy, and jointly in progress along with the other co-accused mentioned in the said charge, stood separated from the ongoing trial in progress. The Court further ordered that the said separated trial from that day (13.06.2006) to be continued under No. BBC-1-B of 1993, in continuity with the earlier joint case. 6. These orders are under challenge in these appeals and writ petition. The appellant has been extradited from Portugal for being tried in eight cases including the Bombay Bomb Blast Case No. 1 of 1993 subject to certain conditions and the sovereign assurance given by the Government of India to the Government of Portugal. It was his stand that the charges under Sections 3(4), 5 and 6 of the TADA Act, Sections 4(b) and 5 of the Explosive Substances Act, Section 25 of the Arms Act and Section 9B of the Explosives Act (in R.C. No. 1(S/93)/CBI/STF (Bomb Blast Case) and charges under Section 120B, 387 and 386 of the Indian Penal Code and under Section 5 of the TADA (in C.R. No. 144 of 1995) are in flagrant disobedience of the mandate of Section 21 of the Indian Extradition Act as well as the solemn sovereign assurance of the Government of India, the ministerial order of extradition of the appellant passed by the Government of Portugal, the judgment of the Court of Appeals as well as the Supreme Court of Portugal. 8. It is also his grievance that time and again the authorities abused the process of criminal law by failing to file the orders passed by Portugal Courts and by willfully and deliberately violating the solemn sovereign assurance. It is his categorical claim that the respondents are lowering the esteem of the nation by their deceitful behaviour in the field of international law, breaching the principle of speciality established under the rule of international law and recognized by Section 21 of the Extradition Act after securing the extradition and gaining control of the appellant. The construction made by the Designated Court is not acceptable and the appellant is being wrongly tried by the Designated Court in violation of the extradition decree and prayed for nter aliashing of the entire proceedings. 9. Heard Mr. S. Pasbola, learned counsel for the appellant and Mr. Gopal Subramaniam, learned Solicitor General and Mr. H.P. Rawal, learned Additional Solicitor General for the respondents. 10. The contention of the appellant that he is being tried for the offences for which he has not been specifically extradited, has been rejected by way of the impugned order on the ground that the extradition has been granted for the offences of higher degree and the additional offences for which he is being tried are subsumed/included in the said higher degree of offences and the trial would be permissible by virtue of clause (b) of Section 21 of the Extradition Act, 1962. As pointed out earlier, apart from the appeals against the order of the Designated Court, the appellant has also preferred a writ petition seeking to invoke the extraordinary writ jurisdiction of this Court on the ground that the trial for the offences for which he has specifically not been extradited is violative of the fundamental rights enshrined under Article 21 of the Constitution of India which guarantees a fair trial with due process of law. 11. The term 'extradition' denotes the process whereby under a concluded treaty one State surrenders to any other State at its request, a person accused or convicted of a criminal offence committed against the laws of the requesting State, such requesting State being competent to try the alleged offender. Though extradition is granted in implementation of the international commitment of the State, the procedure to be followed by the courts in deciding, whether extradition should be granted and on what terms, is determined by the municipal law of the land. Extradition is founded on the broad principle that it is in the interest of civilised communities that criminals should not go unpunished and on that account it is recognised as a part of the comity of nations that one State should ordinarily afford to another State assistance towards bringing offenders to justice. 12. With the tremendous increase in the facility of international transport and communication, extradition has assumed prominence since the advent of the present century. Because of the negative attitude of the customary international law on the subject, extradition is by and large dealt with by bilateral treaties. These treaties, inasmuch as they affected, the rights of private citizens, required in their turn alterations in the laws and statutes of the States which had concluded them. The established principle requires that without formal authority either by treaty or by statute, fugitive criminals would not be surrendered nor would their surrender be requested. 13. There is no general rule that all treaty rights and obligations lapse upon external changes of sovereignty over territory nor is there any generally accepted principle favouring the continuity of treaty relations. Treaties may be affected when one State succeeds wholly or in part to the legal personality and territory of another. The conditions under which the treaties of the latter survive depend on many factors including the precise form and origin of the succession and the type of treaty concerned. The emancipated territories on becoming independent States may prefer to give general notice that they were beginning with a "clean slate" so far as their future treaty relations were concerned, or may give so- called "pick and choose" notifications as to treaties as were formally applicable to it before achieving independence. The "clean slate" doctrine was ultimately adopted in the relevant provisions of the Vienna Convention of 1978. The sound general working rule which emerges is to look at the text of the relevant treaty and other arrangements accompanying change of sovereignty and then ascertain as to what was the intention of the State concerned as to the continuance or passing of any rights or obligations under the treaty concerned. The question whether a State is in a position to perform its treaty obligations is essentially a political question which has to be determined keeping in view the circumstances prevailing and accompanying the change of sovereignty. 14. We have already referred to the factual details. Hence there is no need to repeat the same once again. However, it is useful to advert the following information, namely, on 04.11.1993, a single charge-sheet was filed in the Designated Court against 189 accused persons, of which, 44 accused persons were shown absconding. The role attributed to Abu Salem in RCI(S) relating to the Bombay Bomb Blast case of 1993 was that he was entrusted with the task of transportation of illegally smuggled arms and ammunitions and their storage and distribution to other co-accused. A portion of arms smuggled on 09.01.1993 were taken to village Sansrod, Distt. Bharuch, Gujarat on the instructions of absconding accused Anees Ibrahim Kaskar. Subsequently, the appellant took AK- 56, ammunitions and hand grenades to Mumbai and distributed amongst various co- accused. A Red Corner Notice bearing No. A-103/3-1995 was issued through Interpol for the arrest of the appellant. On 19.11.1993, further investigation was transferred to C.B.I. The CBI registered case Crime No. RC1(S)/93/STF/BB. Consequently, further investigation was conducted by CBI and supplementary reports were filed under Section 173(8) of Cr.P.C. before the Designated Court on various dates. On 10.04.1995, the Designated Court, Mumbai, after hearing the arguments of both sides, framed charges against the accused persons. The Court framed a common charge of criminal conspiracy against all the accused persons present before it, absconding accused and other unknown accused persons. The appellant has been named in the charge as absconding accused. The charge included the offence of conspiracy also for the offences with which he has been substantively charged. By order dated 19.06.1995, before commencing examination of witnesses, the Designated Court directed that evidence to be adduced against the absconding accused persons for the purpose of Section 299 of the Cr.P.C. On 18.09.2002, the appellant was detained by Portuguese Police, initially in a passport case and subsequently, in view of the Red Corner Notice. 15. In December, 2002, Government of India submitted request for extradition of the appellant in 9 criminal cases (three cases of CBI, two cases of Mumbai Police and four cases of Delhi Police). (f) "fugitive criminal" means a person who is accused or convicted of an extradition offence within the jurisdiction of a foreign State and includes a person who, while in India, conspires, attempts to commit or incites or participates as an accomplice in the commission of an extradition offence in a foreign State. (j) "treaty State" means a foreign State with which an extradition treaty is in operation." "3. Application of Act.- (1) The Central Government may, by notified order, direct that the provisions of this Act other than Chapter III shall apply to such foreign State or part thereof as may be specified in the order. (2) The Central Government may, by the same notified order as is referred to in sub-section (1) or any subsequent notified order, restrict such application to fugitive criminals found, or suspected to be, in such part of India as may be specified in the order. (c) the Central Government may, by the same or any subsequent notified order, render the application of this Act subject to such modifications, exceptions, conditions and nter alialifications as may be deemed expedient for implementing the treaty with that State. (4) Where there is no extradition treaty made by India with any foreign State, the Central Government may, by notified order, treat any Convention to which India and a foreign State are parties, as an extradition treaty made by India with that foreign State providing for extradition in respect of the offences specified in that Convention." (c) the offence in respect of which the foreign State has given its consent." 201 (causing disappearance of evidence of offence); 302 (Punishment for Murder); 307 (Attempt to murder); 324 (Voluntarily causing hurt by dangerous weapons); 326 (voluntarily causing grievous hurt by dangerous weapons); 427 (Mischief causing damage); 435 (Mischief by fire); 468 (Forgery for purpose of cheating); 471(Using as genuine a forged document) of the Indian Penal Code read with Sections 3, 4 and 5 of Terrorist and Disruptive Activities (Prevention) Act, 1987 read with Sections 3, 7(a), 25(1)(A), 25(1)(AA), 26, 29, 35 of Arms Act 1959 read with Sections 3, 4, 5 & 6 of Explosive Substances Act of 1998 read with Section 12(1)(b) of the Passport Act, 1967 and 120-B (Punishment for Criminal Conspiracy) of Indian Penal Code. Section 307 (Attempt to Murder); and 34 (Acts done by several persons in furtherance of common intention) of Indian Penal Code in connection with CR No. 144/99 of Police Station D.N. Nagar, Mumbai. Particulars of the person whose extradition is being requested, facts of the cases, relevant laws under which he has been charged and the evidence to justify the issue of warrant for his arrest have been given in the form of duly sworn Affidavit together with other supporting documents in the enclosed volumes. I may further state that there are a number of other criminal cases in which Mr. Abu Salem Abdul Qayoom Ansari is involved. A formal extradition request in respect of some of these criminal cases will be submitted shortly. I, hereby, certify that all documents enclosed herewith have been authenticated, I have signed my name and caused my seal to be affixed hereunto at New Delhi today, the 13th December, 2002. Government of the Republic of India"
18. On 13.12.2002, a Gazette Notification was issued making the provisions of the Extradition Act, except Chapter III, applicable to Portuguese Republic under sub-Section (1) of Section 3 of the said Act. (published in the Gazette of India, Extraordinary, Pt. II, Section 3(i) Dated 13.12.2002). At the outset, I would like to express my deep appreciation for your letter October 4, 2002 in response to the letter of our External Affairs Minister of September 23, 2002 regarding the return of Abu Salem Abdul Qayoom Ansari to India. In your letter, you had advised that a formal extradition request be presented which would fulfill the requirements of Portuguese law. Accordingly, the concerned authorities in India have been in the process of preparing the required formal extradition request for presentation. In this context, we have been informed that under Portuguese law, an offender cannot be extradited to the requesting country if the offence or offences committed attract the visitation of either the death penalty or imprisonment for an indefinite period beyond 25 years. As the offences Abu Salem Abdul Qayoom Ansari is charged with or accused of would attract the death penalty and life imprisonment under Indian law, a solemn sovereign assurance is required to enable his extradition from Portugal to India. The Government of India also desires that Abu Salem Abdul Qayoom Ansari's accomplice, Monica Bedi, be extradited to India. One of the offences she is accused of would carry the penalty of life imprisonment, Monica Bedi was arrested in Portugal on September 18, 2002 along with Abu Salem Abdul Qayoom Ansari. The issue of the legal basis for the above assurance to be given by the Government of India has been given due attention. I may mention that Section 34(c) of the Indian Extradition Act, 1962 states that "Notwithstanding anything contained in any other law for the time being in force, where a fugitive criminal, who has committed an extradition offence punishable with death in India is surrendered or returned by a foreign State on the request of the Government and the laws of that foreign State do not provide for the death penalty for such an offence, such fugitive criminal shall be liable for punishment of imprisonment for life only for that offence." Further Article 72(1) of the Constitution of India provides that "The President shall have the power to grant pardons, reprieves, respites or remissions of punishment or to suspend, remit or commute the sentence of any person convicted of any offence." In all cases where the punishment or sentence is for any offence against any law relating to a matter to which the executive power of the Union extends including where the sentence is a sentence of death. Further, it is a settled law that the power under Article 72 of the Constitution of India is to be exercised on the advice of the Government and not by the President acting on his own and that the advice of the Government is binding on the Head of the State. Also, the President's power under the said Article 72 is a constitutional power and is beyond judicial review. It is also pertinent to state that in addition to the above provisions, Section 432 and 433 of the Code of Criminal Procedure of India 1973 confer power on the Government, to commute a sentence of life imprisonment to a term not exceeding 14 years. The Government of India, therefore, on the basis of the provisions of the Constitution of India, the Indian Extradition Act, 1962 and the Code of Criminal Procedure of India, 1973 solemnly assures the Government of Portugal that it will exercise its powers conferred by the Indian laws to ensure that if extradited by Portugal for trial in India, Abu Salem Abdul Qayoom Ansari and Monica Bedi would not be visited by death penalty or imprisonment for a term beyond 25 years. H.E. MR. ANTONIO MARTINS DA CRUZ MINISTER FOR FOREIGN AFFAIRS PORTUGAL"
20. In pursuance of all the above assurances and communications, on 28.03.2003, the Ministerial order came to be passed admitting extradition amongst others for Section 120B read with Section 302 IPC, Section 3(2) of TADA. However, the ministerial order declines extradition for Section 25(1A) and (1B) of the Arms Act and Sections 4 & 5 of Explosive Substances Act. On 25.05.2003, the Ambassador of India in Lisbon gave further assurance that they will not be tried for offences other than those for which extradition was sought for and they will not be extradited to a third country. 21. In pursuance of the Ministerial order dated 28.03.2003, Her Excellency, the Minister of Justice, under the terms provided in No. 2 of Article 48 of Law 144/99 submitted through the Public Prosecution a request for extradition before the Court of Appeals of Lisbon. The appellant-Abu Salem also preferred an appeal against the order of Extradition before the Court of Appeals, Lisbon. By order dated 14.07.2004, the Court of Appeals Lisbon agreed to authorize extradition for the offences contained in the request of prosecution with an exception of offences punishable with death or life imprisonment. Aggrieved by the same, the Public Prosecution challenged the order of Court of Appeals before the Supreme Court of Justice by lodging an appeal on 23.07.2004 and sought extradition also for offences punishable with death and life imprisonment. On 29.07.2004, the appellant also filed an appeal against the said order of the Court of Appeals. On 27.01.2005, the Supreme Court of Justice permitted the extradition for the offences in view of the assurances given by the Government of India that the person extradited would not be visited by death penalty or imprisonment for a term beyond 25 years. In addition to the same, on 03.03.2005, the Supreme Court of Justice issued a supplementary order maintaining the decision made on 27.01.2005. 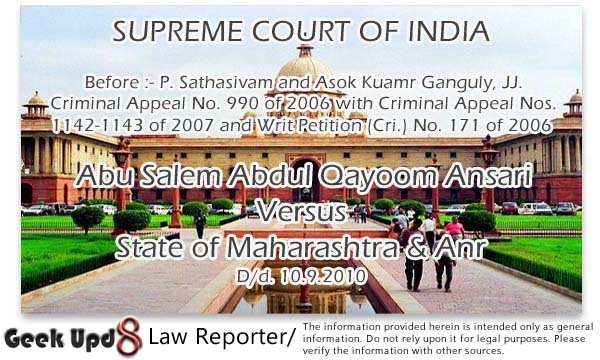 On 13.06.2005, the petition for appeal of the appellant-Abu Salem was rejected by the Constitutional Court by upholding the constitutional validity of the provisions of Article 9.3 of the said New York Convention which obliges the signatory State for extradition for offences covered under it notwithstanding lack of mutual extradition treaty between the parties. On 10.11.2005, the custody of the appellant was handed over to the Indian Authorities and on 11.11.2005, the appellant was brought to India and was produced before the Designated Court, Mumbai in RC-1(S) of 1993 and by order dated 18.03.2006, the substantive charges in addition to charge of conspiracy were framed against the appellant and his plea of not guilty and claim of trial was recorded. Thereafter, the prosecution filed Miscellaneous Application bearing No. 144/2006 seeking separation of the trial of the accused from the main trail in the Bombay Bomb Blast case. In the meanwhile, the appellant also filed Misc. Appeal No. 161 of 2006 seeking production of relevant record of extradition and sought joint trial along with other 123 accused whose trial was nearing completion. By order dated 13.06.2006, the Designated Court allowed the application of the Prosecution for separation of trial and held that the trial would continue as BBC-1-B/1993 in continuity with the earlier joint case. The Designated Court has pointed out that the assurances were given with respect to sentences which could be imposed and not with respect to the offences with which he could be tried. It was further held that the 'lesser offence' in Section 21 of the Extradition Act covers wider matters than the phraseology "minor offence" in Section 222 of Criminal Procedure Code. It was also held by the Designated Court that although the overt acts with which the appellant has been charged may not be cognate with the ingredients of offence with which he has been charged, however, they are lesser offences for the purposes of Section 21 of the Extradition Act. 22. It is relevant to point out that apart from challenging the abovesaid order by way of an appeal under Section 19 of the TADA Act and a writ petition under Article 32 of the Constitution, the appellant has also moved an application before the Court of Appeal in Lisbon that he is being tried in India for violation of Principles of Speciality as contained in Article 16 of Law 144/99. It is brought to our notice that on 18.05.2007, the Court of Appeal expressed its inability to enquire into the question of surrender by the Indian State on the ground that the Indian State has violated certain conditions on which extradition was granted. When the said order was carried in appeal before the Supreme Court of Justice, which by order dated 13.12.2007, remitted the matter to the Court of Appeals to enquire whether there has been violation of any condition as alleged by the appellant. The Court of Appeals, by order dated 13.10.2008, has adjourned the matter till this Court passes a final order in the present case. 23. The main grievance of the appellant is that inasmuch as he being specifically extradited for trial of certain offences only, the present action of the Designated Court and the prosecution adding other offences without recourse to specific order from the Government of Portugal cannot be sustained. Before us, learned counsel for the appellant administered the list of offences for which Government of Portugal agreed to and adding certain other charges which are in flagrant disobedience of the mandate of Section 21 of the Extradition Act as well as the solemn sovereign assurance of the Government of India. According to the appellant, the charges under Sections 3(4) , 5 and 6 of the TADA Act, Sections 4(b) and 5 of the Explosive Substances Act, Section 25 of the Arms Act, Section 9B of the Explosives Act and charges under Section 120-B, 387 and 386 of IPC and under Section 5 of TADA are all impermissible, contrary to the solemn sovereign assurance of the Government of India, the ministerial order of extradition of the appellant passed by the Government of Portugal, the judgment of the Court of Appeals as well as the Supreme Court of Portugal. "According to this principle the State to which a person has been extradited may not, without the consent of the requisitioned State, try a person extradited save for the offence for which he was extradited. Many extradition treaties embody this rule, and the question arises whether it is one of international law or not." "[T]he weight of authority and of sound principle are in favour of the proposition that a person who has been brought within the jurisdiction of the court by virtue of proceedings under an extradition treaty can only be tried for one of the offences described in that treaty, and for the offence with which he is charged in the proceedings for his extradition, until a reasonable time and opportunity have been given him, after his release or trial upon such charge, to return to the country from whose asylum he had been forcibly taken under those proceedings." In view of the aforesaid position in law, both on international law as well as the relevant statute in this country, we dispose of these cases with the conclusion that a fugitive brought into this country under an extradition decree can be tried only for the offences mentioned in the extradition decree and for no other offence and the criminal courts of this country will have no jurisdiction to try such fugitive for any other offence. This writ petition and special leave petitions are disposed of accordingly." (f) an offence in respect of which the person waives the right that he would have (but for Section 146(6)(f) not to be dealt with for the offence. "The operation of the speciality principle in this context can be illustrated by an example, based on the facts of Kerr and Smith (1976) 62 Cr App R 210 (a case under the EA 1870). Suppose that a Part 3 warrant is submitted to Denmark for the return of D for an offence of robbery under Section 8(1) of the Theft Act 1968. The Part 3 warrant only specifies the offence of robbery, however, the factual account of the offence provided by the UK to Denmark refers to D as having carried a sawn-off shotgun in the course of the robbery. This is an offence contrary to Section 18 of the Firearms Act, 1968. Extradition is granted. D could be tried for robbery and for the Section 18 offence because it was disclosed in the information provided to Denmark and Section 146(6)(b) would therefore apply. If, however, evidence came to light that prior to the robbery D had assaulted his wife, then he could not be tried for this offence until after he had been given an opportunity to leave the UK after serving his sentence for the robbery, unless Denmark consented or he waived his rights. This is because the offence of assault did not form part of the information supplied in support of the application for his extradition." 246. Trial on other charges. Where a person accused or convicted of an extradition crime is surrendered by a foreign State, then, until he has been restored or had an opportunity of returning to the foreign State, he is not triable and may not be tried for any offence committed prior to the surrender in any part of Her Majesty's dominions other than such of the extradition crimes as may be proved by the facts on which the surrender is grounded. It follows that a person extradited on a particular charge is triable for any other crime provable by the facts upon which is surrender is grounded. Where the defendant alleges that he is being tried for an offence which is not an extradition crime the onus of proving that he was surrendered under extradition law is on him." A slight variation in the description of the offence in the extradition proceedings and in the subsequent indictment or information does not violate the rule of speciality, it is generally sufficient if the facts shown in the extradition proceedings and those relied upon in the accusation and at the trial are substantially the same, although the crime itself may have a different name in the surrendering country. And if extradition was based on several charges, it is immaterial whether the trial is on all or any of them. Although a returned fugitive may ordinarily be tried for any offence included in the crime with which he has been charged. But a person extradited as an accomplice may be tried as a principal where the distinction between the two has been abolished in the demanding state. Applying similar reasoning, the fact that an extradited person could not be convicted of conspiracy, because the foreign country took the position that the conspiracy charge was not included in the list of offences giving rise to a treaty obligation to extradite, did not prevent the United States from using evidence of a conspiracy to convict the defendant on the substantive counts." 1. No person who, as a consequence of international cooperation, appears in Portugal for the purpose of participating in criminal proceedings, either as a suspect an accused or a sentenced person, shall be proceeded against, sentenced or detained nor shall he be in any way restricted in his personal freedom, for any act committed prior to his presence on the national territory, other than the act or acts on the grounds of which the request for cooperation was made by a Portuguese authority. 2. No person who, in the same terms as above, appears before a foreign authority shall be proceeded against, sentenced, detained, nor shall he be in any way restricted in his personal freedom, for any act committed, or any sentence passed, prior to his leaving the Portuguese territory, other than those mentioned in the request for cooperation. 3. The surrender of a person to the requesting State as mentioned in the preceding paragraph shall not be authorized unless that State provides the necessary guarantees to the effect that the rule of speciality shall be complied with. (b) where the State that authorized the transfer, once the suspect, the accused or the sentenced person have been heard, consents to a derogation to the rule of speciality. 5. The provisions of paragraphs 1 and 2 above do not preclude the possibility of extending the cooperation previously sought, by way of a new request, to facts other than those on the grounds of which the original request was made; the new request shall be prepared or examined, as applicable, in accordance with the provisions of this law. 6. 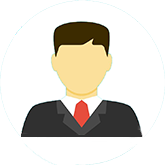 Any request made under the provisions of the preceding paragraph shall be accompanied by a document established by the competent authority, containing the statements made by the person who benefits from the rule of speciality. 7. Where the request is submitted to a foreign State, the document mentioned in the preceding paragraph shall be established before the "Tribunal da Relacao" "1" (Court of appeal) that has jurisdiction over the ara where the person who benefits from the rule of speciality resides or is staying." In this regard, we may point out that Indian Extradition Act of 1962 also recognizes the Doctrine of Speciality in Section 21 of the Act which we have already extracted. The Doctrine of Speciality is a universally recognized principle of international law and partakes of doctrines of both double criminality and reciprocity. "28. On behalf of Suman Sood, one more argument was advanced. It was contended that extradition order in her case did not refer to Section 365 IPC but both the courts convicted her for the said offence under Sections 365/120- B IPC which was illegal, unlawful and without authority of law. Her conviction and imposition of sentence for an offence punishable under Section 365 read with Section 120-B IPC, therefore, is liable to be set aside. 29. We find no substance in the said contention as well. It is no doubt true that Section 365 IPC had not been mentioned in the order of extradition. But as already seen earlier, Section 364-A IPC had been included in the decree. Now, it is well settled that if the accused is charged for a higher offence and on the evidence led by the prosecution, the court finds that the accused has not committed that offence but is enter alially satisfied that he has committed a lesser offence, then he can be convicted for such lesser offence. Thus, if A is charged with an offence of committing murder of B, and the court finds that A has not committed murder as defined in Section 300 IPC but is convinced that A has committed an offence of culpable homicide not amounting to murder (as defined in Section 299 IPC), there is no bar on the court in convicting A for the said offence and no grievance can be made by A against such conviction. "21. Accused or convicted person surrendered or returned by foreign State or Commonwealth country not to be tried for previous offence. -- Whenever any person accused or convicted of an offence, which, if committed in India, would be an extradition offence, is surrendered or returned by a foreign State or Commonwealth country, that person shall not, until he has been restored or has had an opportunity of returning to that State or country, be tried in India for an offence committed prior to the surrender or return, other than the extradition offence proved by the facts on which the surrender or return is based." 32. It is, therefore, clear that the general principle of administration of criminal justice applicable and all throughout applied to domestic or municipal law has also been extended to international law or law of nations and to cases covered by extradition treaties. "The provision of the aforesaid section places restrictions on the trial of the person extradited and it operates as a bar to the trial of the fugitive criminal for any other offence until the condition of restoration or opportunity to return is satisfied. Under the amended Act of 1993, therefore, a fugitive could be tried for any lesser offence, disclosed by the facts proved or even for the offence in respect of which the foreign State has given its consent. It thus enables to try the fugitive for a lesser offence, without restoring him to the State or for any other offence, if the State concerned gives its consent." The ratio in the Suman Sood (supra) is directly applicable to the case on hand. 27. The main grievance of the appellant, as stated above, is that he had been extradited under International Convention for the Suppression of Terrorist Bombings and therefore, he can be tried only for the offences which are related to the said Convention. The said assumption cannot be sustained. If the said claim is accepted, it would be contrary to the judgment of the Constitutional Court of Portugal and it also shows the ignorance of the appellant towards the notification dated 13.12.2002, issued by the Government of India making the Extradition Act, 1962 applicable to Government of Portugal except Chapter III. As rightly pointed out by the respondents that the Court has not granted extradition merely on the basis of Extradition Treaty but also on the basis of reciprocity. Pursuant to Section 3 of the Act, the order of the Government of India GSR-822(E) dated 13.12.2002 had been approved and published ensuring due regard for the principle of reciprocity. In view of the same, the claim of the appellant is without any substance. 28. As discussed earlier, it is true that there is no Extradition Treaty between India and Portugal. However, the laws of both the countries permit entertaining request for extradition from Non Treaty States also. The extradition request was made to the Government of Portugal by the Government of India under the provisions of the Extradition Act applicable to Non Treaty States i.e. Section 19 of the Act. Although the Convention was also relied upon for the extradition, as rightly pointed out by the respondent, it was not the sole basis as is apparent from the Letter of Request. The primary consideration for the request of extradition was the assurance of reciprocity. The notification dated 13.12.2002 by the Government of India directing that the provisions contained in the Extradition Act shall be applicable to the Republic of Portugal was issued keeping in view the said principle of reciprocity. For the purpose of extradition proceedings, appellant-Abu Salem was treated as a fugitive criminal as defined under Section 2(f) of the Extradition Act, 1962. We have already adverted to the Gazette Notification dated 13.12.2002 making it clear that the provisions of Extradition Act shall apply to Portuguese Republic in accordance with the principle of reciprocity. The provisions of the Act are applicable in respect of the extradition of appellant-Abu Salem. The Court of Appeals of Lisbon has recognized this principle of reciprocity and the applicability of the provisions of the Extradition Act, 1962 to the Republic of Portugal. The Supreme Court of Justice and Constitutional Court of Portugal have also approved it. None of these Courts have mentioned in their orders that the accused could not be tried in India for the offences for which his trial could take place as per the domestic laws of India. 29. We have already adverted to Section 21 of the Extradition Act. A bare reading of the above section would indicate that the appellant-Abu Salem can be tried for the offences for which he has been extradited. The Supreme Court of Justice, Portugal has granted extradition of appellant-Abu Salem for all the offences mentioned in para-1 of the order dated 27.01.2005. In addition, Abu Salem can also be tried for lesser offence/offences in view of Section 21 of the Extradition Act disclosed by the facts proved for the purposes of securing his surrender. "Lesser offence" means an offence which is made out from the proved facts and provides lesser punishment, as compared to the offences for which the fugitive has been extradited. The offence has to be an extradition offence, as defined under Section 2 (c) (ii) of the Act i.e. an offence punishable with imprisonment for a term which shall not be less than one year under the laws of India or of a foreign State. The lesser offence cannot be enter aliated with the term "minor offence" as mentioned in Section 222 of the Code of Criminal Procedure. The Legislature has deliberately used the word "lesser" in Section 21(b) of the Extradition Act instead of the word "minor". Thus, the punishment provided for the offence is relevant and not the ingredients for the purposes of interpretation of the term "lesser offence". 30. The contention of the appellant that he can be tried only for the offences covered under Article 2(1) of the said Convention is misconceived in view of the fact that he was extradited not only under the said Convention but also in the light of the principle of reciprocity made applicable through the application of the Extradition Act to the Republic of Portugal. A complete reading of Article 2 of the said Convention makes it clear that it deals not only with those accused who commit the substantive offences as defined in Article 2(1) but also includes all the conspirators and those who have constructive liability for commission of the substantive offences as per Sub- section 3 of Article 2 of the Convention, which fact has also been mentioned by the Supreme Court of Justice, Portugal in para 9.4 of its order. Further sub-section (d) of Article 1(3) of the Convention makes it abundantly clear that the explosive or lethal device means a weapon or device i.e. designed, or has the capability to cause death, serious bodily injury or substantial material damage through its release etc. AK- 56 rifles are the weapons/devices, which have the capability to cause death and serious bodily injury through the release of cartridges and are covered under the said Article. The appellant has been charged for possession, transportation and distribution of AK-56 rifles, their ammunitions as well as hand-grenades, which were illegally smuggled into the country in pursuance of the criminal conspiracy. 31. We are also satisfied that there has been no violation of Rule of Speciality and the Solemn Sovereign Assurance given by the Government of India in the letter dated 25.05.2003 of the Indian Ambassador to the Government of Portugal regarding the trial of the appellant-Abu Salem. The said assurance of the Indian Ambassador was given to the effect that the appellant will not be prosecuted for the offences other than those for which his extradition has been sought and that he will not be re-extradited to any other third country. As rightly pointed out by the Solicitor General, there has been no violation of Rule of Speciality. As per the Government of India Gazette Notification dated 13.12.2002, all the provisions contained under the Extradition Act are made applicable in respect of the extradition of Abu Salem except those contained in Chapter III of the Act. The Court of Appeals in Lisbon, has recognized this principle of reciprocity and the applicability of the provisions of Extradition Act to Portugal. The Supreme Court of Justice and Constitutional Court of Portugal have also approved it. In view of the fact that the provisions of the Extradition Act, 1962 have been made applicable to Portugal, provisions contained in Section 21 of the Act would come into operation while conducting the trial of appellant-Abu Salem. 32. We are also satisfied that the Designated Judge has correctly concluded that the appellant-Abu Salem can be tried for 'lesser offences', even if, the same are not covered by the Extradition Decree since the same is permitted under Section 21(b) of the Extradition Act. No bar has been placed by the Portuguese Courts for the trial of lesser offences in accordance with the provisions contained under Section 21(b) of the Extradition Act although Portuguese Courts were aware of the said provisions of Extradition Act. 33. We have already highlighted how the Government of India and the Government of Portugal entered into an agreement at the higher level mentioning the relevant offences and the appellant was extradited to India to face the trial. We have also noted the Notification of the Government of India about the applicability of Extradition Act, 1962. In the light of the said Notification, the additional charges that have been framed fit well within the proviso to Section 21(b) of the Extradition Act. The offences with which the appellant has been additionally charged are lesser than the offences for which the appellant has been extradited. To put it clear, the offences with which the appellant is charged are punishable with lesser punishment than the offence for which he has been extradited. The extradition granted in the present case had due regard to the facts placed which would cover the offences with which the appellant has been charged. As rightly pointed out by learned Solicitor General, the offences are disclosed by the same set of facts placed before the Government of Portugal. We agree with the submission of the learned Solicitor General and the ultimate decision of the Designated Court. 34. Coming to the order of the Designated Court directing separation of the trial of the appellant, it is the grievance of the appellant that because of the separation, he would forego the opportunity to cross-examine the witnesses. This grievance has been dealt with in a separate set of proceeding which we have adverted to in the earlier part of our judgment. The order dated 24.08.2009 has granted the appellant an opportunity to submit a list of witnesses examined in the main trial for cross-examination. Hence, there is no basis in the apprehension raised by the appellant. 35. In the light of the above discussion, we are of the view that the appellant has been charged within the permissible scope of Section 21(b) of the Extradition Act and the Designated Court has not committed any illegality in passing the impugned orders. Consequently, all the appeals as well as the writ petition are liable to be dismissed, accordingly dismissed. Since the trial is pending from the year 1983 and connected matters have already been disposed of, we direct the Designated Court to proceed with the trial expeditiously. 35A. I have gone through the judgment prepared by Hon'ble Brother Justice P. Sathasivam and I agree with the conclusions reached by His Lordship. 36. Having regard to the importance of the issues discussed in the judgment, may I express my views on the same. 37. Conceptually extradition is a rather complex jurisprudential zone as it has encompassed within itself various trajectories of apparently conflicting ideas. 38. Generally, a State's criminal jurisdiction extends over offences committed within its geographical boundaries but it is the common experience of all the countries that often a criminal committing an offence in one country flees to another country and thus seeks to avoid conviction and the consequential punishment. This poses a threat in all civilized countries to a fair adjudication of crime and sustaining the Constitutional norms of Rule of Law. 39. To remedy such anomalous and unjust situation, Extradition has been evolved by way of International treaty obligation which ensures a mode of formal surrender of an accused by the one country to another based on reciprocal arrangements. "the surrender by one nation to another of an individual accused or convicted of an offence outside of its own territory, and within the territorial jurisdiction of the other, which, being competent to try and to punish him, demands the surrender." 42. But extradition is different from deportation by which competent State authorities order a person to leave a country and prevent him from returning to the same territory. Extradition is also different from exclusion, by which an individual is prohibited from staying in one part of a Sovereign State. As a result of such orders, sometimes deserters or absentees from Armed Forces of a particular country are returned to the custody of Armed Forces of the country to which they belong. 43. Both deportation and exclusion basically are non-consensual exercise whereas extradition is based on a consensual treaty obligation between the requesting State and the requested State. Extradition, however, is only to be resorted to in cases of serious offences and Lord Templeman was right in holding that extradition treaties and legislation are designed to combine speed and justice [Re Evans - 1994 (3) All E.R. 449 at 450-451]. "... inherent in the whole of the Convention (European Convention on Human Rights) is a search for a fair balance between the demands of the general interest of the community and the requirements of the protection of the individual's fundamental rights. As movement about the world becomes easier and crime takes on a larger international dimension, it is increasingly in the interests of all nations that suspected offenders who flee abroad should be brought to justice. Conversely, the establishment of safe havens for fugitives would not only result in danger for the State obliged to harbour the protected person but also tend to undermine the foundations of extradition. These considerations must also be included among the factors to be taken into account in the interpretation and application of the notions of inhuman and degrading treatment or punishment in extradition cases." 45. The extradition law, therefore, has to be an amalgam of international and national law. Normally in extradition law the requested State is to follow the rule of Non-Inquiry which means that the requested State is not to normally make inquiry about the nature of criminal justice system in the requesting State. That is why in this case, on a complaint being made by Abu Salem in the Court of the requested country, the Courts of Portugal await the decision of this Court. The actual conduct of trial of the extradited accused is left to the criminal jurisprudence followed in the requesting State. This rule of Non-Inquiry is a well developed norm both in Canada and in America [See the decision of Canadian Supreme Court in Canada v. Schmidt, (1987) 1 SCR 500. "that I see nothing unjust in surrendering to a foreign country a person accused of having committed a crime there for trial in the ordinary way in accordance with the system for the administration of justice prevailing in that country simply because that system is substantially different from ours with different checks and balances. The judicial process in a foreign country must not be subjected to finicky evaluations against the rules governing the legal process in this country." 47. Whether or not the fugitive who has been extradited would have a standing to complaint of the judicial process in the requesting State after extradition has been done, independent of the position taken by the requested State, is a debatable issue. It is a part of the larger debate about the position of an individual as a subject of international law, and the obligation of States towards individuals. This is pertinent here because one of the claims made by Abu Salem is with respect to the erosion of his rights that exist by way of the international commitments India has made through the doctrine of specialty embodied in section 21 of the Extradition Act. His complaint is that by trying him for some offences which are designated as 'lesser offences' and calling them as completely similar to the ones mentioned before the Portuguese authorities, as well as by separating his trial from the other accused, the Government of India has violated its commitments in the extradition request, and therefore has violated the rights with which Abu Salem had been extradited. The answer to this complaint obviously lies in the principle of non-inquiry which prohibits questioning the fairness of the judicial process in the requesting State. That is why the Courts of Portugal await the decision of this Court. However, non-inquiry is not an absolute principle. 48. In a given situation, the requested State may question the procedures in the requesting State if they are prima facie contrary to fundamental principles of justice and there is a high risk of the fugitive being prejudiced by the process of extradition. 49. There are cases where the requested State has rejected the extradition request as the requesting State may have procedures that are basically incompatible with the practices of the requested State. The most remarkable example is in Soering (supra) where the European Court of Human Rights struck down an extradition request from the USA on the ground of it being violative of Article 3 of the European Convention on Human Rights which prohibits inhuman and degrading treatment of humans. It said that the prolonged delay in the form of death row, which is a natural outcome of the criminal procedure existing in the USA, was certainly violative of the human rights of the fugitive, for it was torturous for him to wait in anticipation of a death that was almost certain for him in the USA. 50. Furthermore obligations entered by many countries of the world, including India, in the form of Covenant on Civil and Political Rights, and The Convention Against Torture and Other Cruel, Inhuman or Degrading Treatment or Punishment (to which India is a Signatory), would preclude a total and unconditional observance of the principle of non-inquiry. Even though, non- inquiry is not an absolute doctrine, but in facts of the present case, it operates. 51. In this case, the insistence of the Central Government on trying Abu Salem for lesser offences is permissible, both under the Extradition Act as well as under the Convention for Suppressing Terrorist Bombings. 52. United Nations General Assembly adopted on 15th December 1997, the International Convention for the Suppression of Terrorist Bombings. India has been a party to this Convention, ever since the Union Cabinet approved it on 5th of August, 1999 and India formally ratified it on 17th of September 1999. This Convention creates a broad platform for international cooperation to suppress and deal with unlawful and international use of explosives and other lethal devices in various public places with the intention to cause serious bodily damage and extensive destruction. 53. The Convention thus fills up a huge void in international law by expanding the legal framework and enabling several States to cooperate in the investigation, prosecution and extradition of several persons who are engaged in such international terrorism. It is of utmost importance as it strengthens international law enforcement in controlling international terrorism. 55. There are two ways in which to describe a lesser crime. Either every single element of a lesser crime should be component of the greater crime on the basis of their statutory definitions; or the allegations of the larger crime in the indictment should include all the factual details of the lesser crime. (See Submission of Lesser Crimes, Columbia Law Review, Volume 56(6), 1956 pp.888-902, at 888-890). 56. Section 21(b) of the Act seems to embody the latter of these two principles. This means that a crime which can be framed from out of the factual averments themselves (i.e. evidence submitted) before the requested State at the time of extradition, can be the one upon which the fugitive can be tried. A lesser crime can be a cognate crime, in that it shares its roots with the primary crime, even though it may be independent of it. "Thus in true sense all such offences would always be lesser offence of conspiracy of which pivotal charge of conspiracy is framed at the trial subject to such offences being punishable with lesser punishment than prescribed for main offence of conspiracy." 58. In the instant case the extradition has been allowed by the requested State on the specific undertaking of the Government of India that the extradited criminal will not be subjected to death penalty or imprisonment beyond 25 years. Therefore, the basic human rights considerations have been taken into account and the guidelines in Soering (supra) have been adhered to. Thus, primacy has been accorded to human right norms in the extradition process. 59. Doctrinally speaking, Extradition has five substantive ingredients. They are: (a) reciprocity, (b) double criminality, (c) extraditable offences, (d) specialty and (e) non inquiry. "At present, the Law of Extradition in India is contained in the Extradition Act, 1962 (Act 34 of 1962). The 1962-Act made a distinction between Commonwealth countries and foreign States and considered only foreign States as treaty States. The extradition with Commonwealth countries was separately governed by the second schedule of the Act and the Central Government was given powers under Chapter III to conclude special extradition arrangements with respect to Commonwealth countries only. Such distinction made in the Extradition Act, 1962 between foreign States and Commonwealth countries does not hold good in view of the change of time and rapid developments in Extradition Law at international level. Commonwealth countries are concluding extradition treaties among themselves. India has in recent years concluded separate extradition treaties with Canada and UK. Moreover, the Civil Law countries have specific requirements for purposes of extradition with them. In addition, terrorism and drug trafficking as two most heinous crimes affecting innocent lives, have thrown new challenges necessitating changes in the existing Extradition Law to effectively deal with these new crimes. Many International Conventions dealing with these and other crimes have laid down specific obligation on State parties to extradite or prosecute a fugitive offender. India is a State party to many of these International Conventions. g. to enable the Central Government to give assurance pursuant to a treaty obligation to the requested State for the non-execution of death penalty. 3. The Bill seeks to achieve these objects." 61. The above stated objects behind the Amending Act are relevant in appreciating some of the problems in the instant case. As a result of the amendment, Section 21 has been completely recast and the doctrine of Specialty has been introduced. 62. A perusal of the said Amendment Act would make it clear that the amendment enables the requesting State to try the fugitive for a lesser offence without restoring him to the requested State. In fact the doctrine of specialty is in fact a corollary to the principle of double criminality, and is founded on policy and expediency and on the basic principle of reciprocity. It is thus a universally recognized principle of international law and partakes of doctrines of both double criminality and reciprocity. "Where in pursuance of any arrangement with a foreign State, any person accused or convicted of any crime which, if committed in England, would be one of the crimes described in the first schedule to this Act is surrendered by the foreign State, such person shall not, until he has been restored or had an opportunity of returning to such foreign State, be triable or tried for any offence committed prior to the surrender in any part of her Majesty's dominions other than such of the said crimes as may be proved by the fact on which the surrender is grounded." 64. This is in keeping with the rule of double criminality, which requires a mutually acceptable position between the requesting as well as the requested State on all the aspects of the criminal act committed by the person who is to be extradited. This understanding is not about an agreement as to the specifics, but rather a consensus ad idem in the contractual relationship between two sovereign States. Explaining the rule of double criminality, Shearer says, "...This rule requires that an act shall not be extraditable unless it constitutes a crime according to the laws of both the requesting and requested States... The validity of the double criminality rule has never seriously been contested, resting as it does, in part on the basic principle of reciprocity, which underlies the whole structure of extradition, and in part on the maxim nulla poena sine lege" (no penalty without prior legal authority) (See Extradition in International Law (1971) at page 137). 65. This position of extraditable offences, and the obligations of the requesting State can further be understood, if one bears in mind the fact that the doctrines of double criminality and specialty are both safeguards of the individual rights of the extraditee who should not be tried on unexpected counts, as well as the rights of the requested State to have its laws and processes given adequate deference by the requesting State. It is not only a means to protect the person from unexpected prosecution, but also a preventive guard against the abuse of the legal process of the requested State. While the first takes care of the individual's right, the second takes care of the rights of a sovereign State. 66. Therefore it can be said that as long as the facts that have been submitted before the requested State prima facie show the guilt of the extraditee in a foreseeable and logically consistent way, the said person can be tried on all such counts that can be conclusively proved against him or her. 67. Therefore, I do not find any substance in the complaint of Abu Salem. 68. Thus I concur with Brother Sathasivam and reach the same conclusion as His Lordship does. its normal observation, where ever any scam comes on surface and in media, there is blast in the country. First hanging of afzal guru, which to my mind was unconstitutional, as there was considerable delay of mercy petition. a new round should have been started by giving him opportunity to decide if long duration pendency of mercy petition is unconstitutional. it appears there is politics behind death penalty given to him. Now Hyderabad blast. i think politics involved behind it also to divert mind from chopper scam. Even jaweri blast of Mumbai took place immediately after 3G scam became notorious.